My mind filling with the stuff of life. But in this small space surrounded with multiple pillows, a blue down comforter, and total darkness, three hearts beat. Michaels slow and steady rhythm continues regardless of so many obstacles. The varied melodies weave together to create his song of survival. He is the grounding chorus in my world. Next is Chloe, the forever staccato beat of the furry friend who chose us to be her family. She snores softly between us, taking up the majority of space as Michael and I hover close to the edges of the bed. She is waiting patiently for the light of day when she can stretch, wag and experience unbridled joy. And lastly my own beat. A soul full melody echoing in the corners of unfamiliar empty spaces. Peeking behind the shadows and searching for a new and harmonious original score. Hello God. It’s me again. 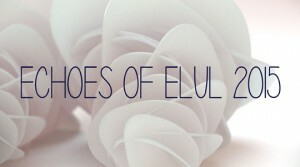 I’m glad we are heading into Elul because it’s like a trip wire for me. I tend to get unconscious and numbed out with the minutia of my life. I am grateful to have this reminder to jumpstart me again and reorganize my priorities.